Overview : Missing something from the PlayStation SIXAXIS? Just cant get your "hands around" it? Now you can! 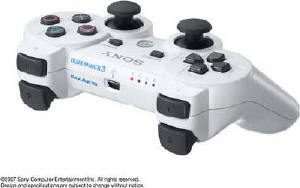 Dual Shock is back and is now featured in the SIXAXIS now known as Dual Shock 3 (DS3). Feel every bump, punch and blast with the rumble of the Official Sony Dual Shock 3 Bluetooth Controller. Quality/Usability : When the PlayStation 3 launched, one vital feature was missing from it. The Xbox 360 has it, the Nintendo Wii has it but the PS3 didnt. Even the PlayStation 2 had it. Know what it is yet? (I think the title gave it away)...RUMBLE! Why was it left out? Well, I wont go into detail (Google) but Sony was being sued for infringing on patents that Immerson had rights to in regards to rumble. So to prevent the PlayStation 3 from being delayed, Sony released the PlayStation 3 with no rumble built into its SIXAXIS controller. It was a huge setback to Sony and a huge disappointment to gamers but a little more than a year after launch, Sony is able to release a Dual Shock version of the SIXAXIS. We all know that rumble wont change how a game plays but it has become an essential part of the gaming experience. A lot of the PlayStation 3 games have great visual and gameplay but lacked that extra feature to give that full enjoyment. Its like eating a burger but all you're eating is the bun, lettuce, ketchup and no meat. Although the review is based on the Japanese version (Europe and North America not released at time of review), it will still work on any PlayStation 3 as there is no territorial lockout on accessories. With the announcement and release of the Dual Shock 3 controller, newer PS3 titles are starting to support new controller. Some games even have patches to support the rumble. Upon removing the controller from its plastic, you'll notice the added weight from the controller immediately. Its not really heavy but you'll notice a difference between the Dual Shock 3 and the SIXAXIS. You'll also notice that the DS3 does not sport the semi-transparent casing that the SIXAXIS does and it is now opaque black. Other than that, layout of buttons and controls are the same and you still have the motion sensor. Setting up the controller is like setting up the SIXAXIS when you first set up the PlayStation 3. Simply connect one end of the USB cable (not included) to the DS3 and the other end to the PS3. Sync the controller and you're set. We put the Dual Shock 3 to work with Ratchet & Clank Future: Tools of Destruction, Uncharted: Drake’s Fortune, Burnout Paradise and Unreal Tournament 3. I must say, everything that you would expect from a Dual Shock. The rumble that we have come to know and love is all here! Not only does it work with PlayStation 3 games, but it worked with PlayStation 2 games as well without a problem. (*1) Users will be able to enjoy the rumble feature through software update. 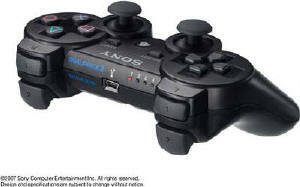 Conclusion : Overall, the PS3 DualShock 3 Controller is a must own for the complete gaming experience. Gaming is not the same anymore without rumble. Rumble is pretty much a standard in gaming these days. Unfortunately, Europe and North America has seen release and wont see it until Spring 2008. The standalone SIXAXIS retails for $50USD but the DualShock 3 should retail for about the same when released. So importing right now, you're paying an extra $10USD and its well worth it. DS3 only comes in two colors; white and black. Remember that it does not come with USB cable so you'll have to use the cable that came with the PlayStation 3.